Corruption, particularly bribery of government officials, inflicts substantial damage on people, society, and the world, and warrants control. Collective efforts to control corruption tend to focus on rules and compliance with those rules. 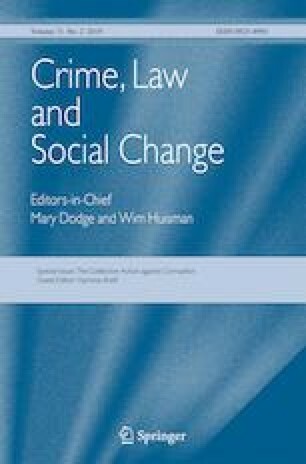 This paper suggests that collective action also consider the creation of strong ethical cultures in business firms. Implementation of such programs is impeded by the difficulty in prescribing a course of action and by the difficulty in measuring the strength of an ethical culture. This paper suggests the measurement and maximization of stakeholder trust as a proxy for measures of ethical culture. The qualities that engender stakeholder trust correspond with ethical behaviors. Stakeholder trust confers benefits on business firms, which will incentivize and justify its measurement. Implementation of a program focused on ethical culture would benefit from collective action both by normalizing behaviors and in the development of sophisticated measurement tools. Hunter, J. (2015). Myth: If you can’t measure it, you can’t manage it. The Deming Institute Blog. https://blog.deming.org/2015/08/myth-if-you-cant-measure-it-you-cant-manage-it/. Zak, P. (2013). Measurement myopia. Drucker Institute. http://www.druckerinstitute.com/2013/07/measurement-myopia/.